It’s official. The Chevrolet Cruze has arrived in Pakistan and has been sighted in Islamabad. The Cruze replaces the Daewoo Lacetti (also known as my beloved Chevrolet Optra) and the Chevi Cobalt. The latter probably doesn’t exist in Pakistan and the Optra is mostly found in Islamabad. The Cruze is quite an impressive car with a new design and a very cool, sporty interior. However, the high price tag in Pakistan is bound to be a hurdle for most people. At least I probably won’t be upgrading anytime soon. how can i get the right price for Cruze and its specification online. That’s an awesome car…..How much cc is it and please i need the specs and prices of all cc’s????????????????? Chevrolet’s Pakistan site (http://www.chevrolet.com.pk) has been suspended for a while now. They probably haven’t paid their hosting dues. 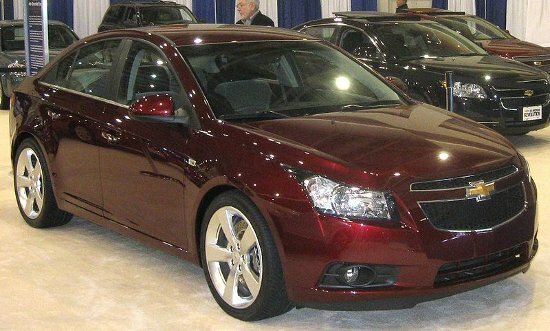 The Cruze comes in 1600cc and 1800cc options. The base model (1600cc, manual transmission, no sunroof) starts at about Rs. 2.3 million and goes up to about Rs. 2.7 million for the full options 1800cc model. Probably best to locate your local dealer.